During weekday mornings, drop in at TayKimTan's indoor play park in Niagara with your kids for some fun! Get your 'Play 4 Times 5th Time FREE' card. Please inquire about our group rates and packages. Please note that TayKimTan's Fun Town does book private functions and will be closed for those designated times. Summer camp weeks are now posted. Send us a message if you are interested, space is limited. We will be closed Friday, April 19th to Monday, April 22nd Happy Easter! Read our Park Rules to learn how we keep your kids safe at TayKimTan. We're always ready for fun! 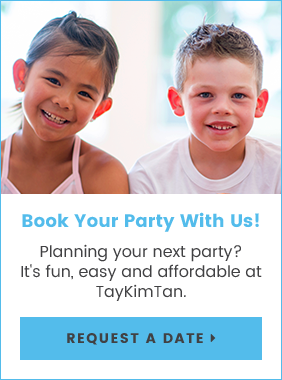 Contact us today to book your next party, or drop by any time for some great indoor fun.